Image of the Ebola virus infecting the blood of a patient who was infected in 2014 in the African nation of Mali. Cincinnati Children's Hospital Medical Center is looking to increase the number of people participating in a clinical trial testing a new Ebola vaccine. It comes at a time when dozens of new Ebola cases are being reported daily in the Democratic Republic of Congo, as the deadly virus continues to spread. Dr. Paul Spearman, director of the Division of Infectious Diseases at Children's, says there's an urgency to test a vaccine. "When it pops up, a lot of people - especially in the epidemic - a lot of people die," he says. "It's not that it can't be dealt with and contained but it strikes fear in communities and really across the world." Spearman is referring to the 2013-2016 epidemic, when more than 11,000 people died from Ebola in West Africa. Spearman says the vaccine he's testing on adults is given in two doses a week apart, and looks very promising. This video featuring Spearman gives more detail on how the vaccine works. It didn't take long for Children's nurse Laura Dozier to decide to participate. She says she wants to help other people. And she has to spend some time convincing friends and family it's safe. "I read all the stuff; they're not going to extract you with Ebola," says Dozier, who is being paid for her participation." 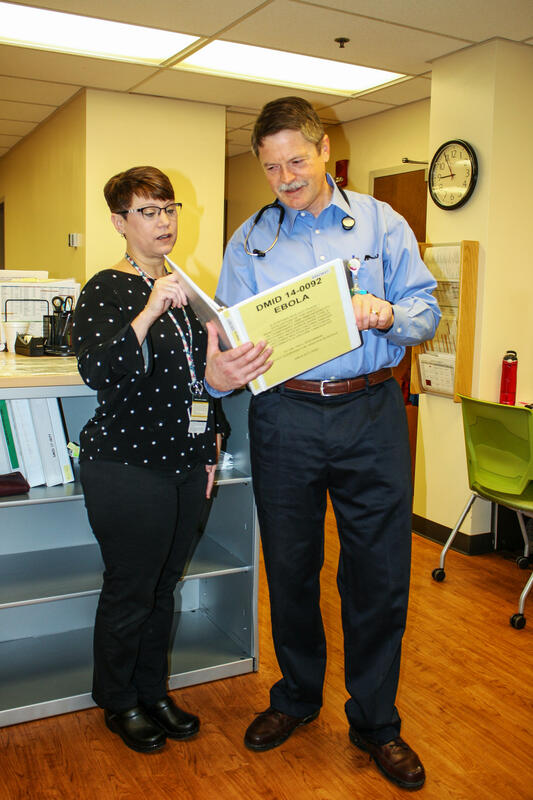 Kristen Buschle, a nurse practitioner in the Gamble Program for Clinical Studies at Cincinnati Children’s and Dr. Paul Spearman, director of Infectious Disease, in the clinical work room at the program’s Oak facility. To be clear, the vaccine - developed at the National Institutes of Health and sponsored by drug company Janssen - does not contain the Ebola virus. Instead, the vaccine contains other inactivated viruses. It took two-and-a-half years before researchers could start testing it on humans. Another new Ebola vaccine has already been deployed in Africa. Spearman says it's important to have more than one. So what are doctors looking at in trial participants? "We're looking at the inflammatory response by looking at the cells in the blood that become activated," Spearman says. "We're looking at the release of these chemicals called cytokines that happens when someone either gets inflammation or has an infection." And he explains, "We're looking at the very basic RNA response in the cells that tells us what genes are activated after getting the vaccine." Children's is the only site nationwide where the new vaccine is being tested on adults. So far it has 12 participants; it needs 60.